In 1953 Lucille Bryant travelled to Las Vegas by car from Tallulah, Louisiana to seek the higher wages and better working conditions. She made the Westside of Las Vegas her home and worked in several casinos. She retired from the Stardust after working there for 31 years. Lucille Bryant’s paternal grandmother raised her following her mother’s death. Her father joined the service during World War II, and after he returned to the United States, he moved west, eventually settling in Palmdale, California, leaving Lucille and her siblings in Louisiana. Lucille married at the age of sixteen, worked as a domestic for white families in Tallulah, and spent her summers working in cotton fields. Bryant’s husband moved to Las Vegas first, and she joined him six months later. In Las Vegas, they settled on the Westside, joining other relatives and neighbors from Tallulah who had immigrated to the area earlier. She got a job on her first day in Las Vegas, working as a maid at the Algiers Hotel. She went on to work at the Silver Slipper and the Sands. Bryant later began working in the uniform room at the Las Vegas Sands, where she worked for 31 ones years. She also became active in the Culinary Union. She raised her children in Las Vegas and was active in their educations. She also furthered her own education after they grew, and earned her degree. Bryant was active in her church. 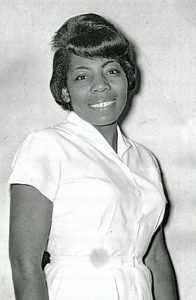 The interview describes Bryant’s experiences working in Las Vegas hotels, the community of the Westside, and the education of her children.